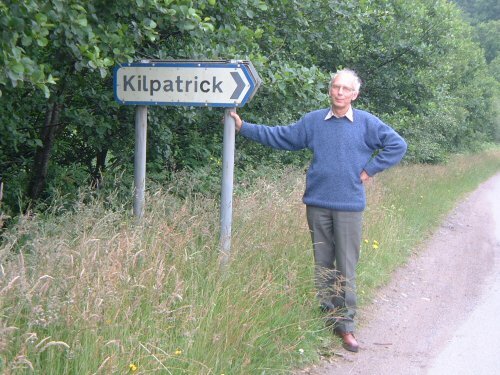 I was born in Oxford in 1941, and at the age of seven was given a place in Christ Church Cathedral Choir under Thomas Armstrong (the family had moved to West Cumberland, so I was a boarder from that young age). There I sang treble for six years; and continued to sing for another 60 years or so, first bass and then tenor, though never with as good a voice as I had as a treble. I retired from membership of the Sheffield Bach Choir after 40 years. 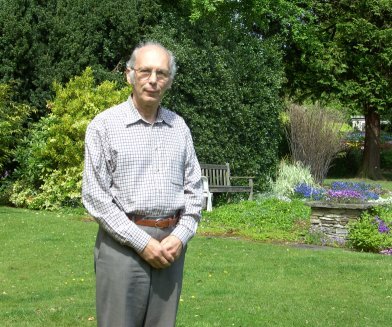 I was in the Sheffield Motet Singers (now closed), and the Danensian Choir (now resigned), and for 13 years or more ran the Sheffield Lydian Singers, but in 2014 I retired from that also, reckoning that 65-70 years of choral music was enough for anyone. At school I played any wind instrument I could get my hands on, especially the clarinet, and now play also the bass clarinet in a clarinet quartet and the contrabass clarinet in a clarinet choir. Clarinets are now supplemented by tenor sax and by tarogato. More recently I have taken up the trombone, playing tenor or bass in one concert band and 1st trombone in another. A further musical interest has been harpsichord making: I have completed over a dozen instruments from kits, and one clavichord of my own design. After several years' gap, I recently completed a spinet. Restoring a dulcitone has been another more recent project. I am not a good keyboard player, though! As a child I loved the nonsense of Edward Lear, and also of the Boston-born Gelett Burgess (hardly known in Britain). When I decided, at some 55 years old, to have a go at composing, I first set some Burgess to music, then my own piece "My Briefcase", followed by some Lear; and later looked further afield. My music is freely available on this website, and mostly also accessible through the Choral Public Domain Library. Once in a while I find my pieces being performed in unexpected places such as East Java or Ealing. In early 2008 the Vocaal Ensemble Kalliope really brought some of my music to life in Ghent. No-one has yet emailed me to tell me my music is rubbish (feel free to do so! ), though I have had more than a few coded messages about it being too difficult. So far my compositions have been for mixed choir, with or without piano (or organ, for sacred music), or for choir with wind quintet or other wind group, and sometimes with a speaker (narrator). I am not a professional musician. On balance, I prefer it that way. My career (if it can be so described) was in industry - first in steel, then at Carbolite: a pleasant company to work for, and supportive of my musical activities. As for spare time, gardening takes quite a lot of it; and who-knows-what-else. My wife is also a singer, and our son a good pianist but lapsed trombonist; we live in Sheffield, though the son now abides in Edinburgh. I've two older sons - both musical - from my first marriage, one of whom is an expert in Duke Ellington's music and publisher of scores of some of Ellington's least known works, many not performed (until now) since the 1930s. 2010 EVENT: Monteverdi Vespers of 1610 at Buxton Festival Fringe. 2012 EVENT: Humour in Harmony at Buxton Festival Fringe. 2014 EVENT: Festive Fancies at Buxton Festival Fringe. And what do I really look like? 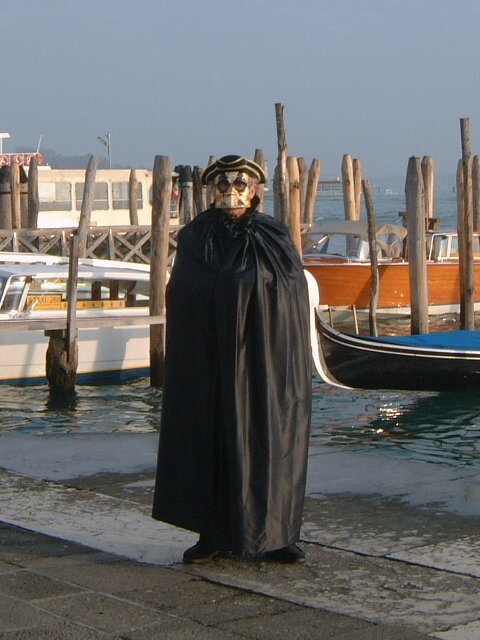 Well, here's a picture of me at the Venice Carnival. And another picture, from the Isle of Mull. 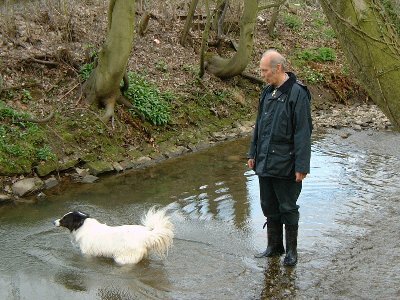 With the dog in the River Sheaf, from which Sheffield takes its name. Sadly the dog is no more: after 13 years with us she died at around 15-16 years old, 4 years after first suffering a stroke.